This is the patron church of Paris. It is located on a square between the Place de la Concorde and the Opera House. 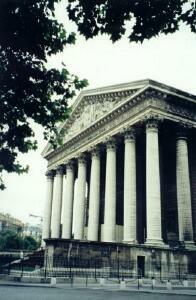 It has been a temple for Napoleon, a library, a stock exchange, a theatre, and the Bank of France. In 1842, it was completed as a church.